As the 2014-15 quidditch season tipped off, a number of teams unveiled new partnership agreements. 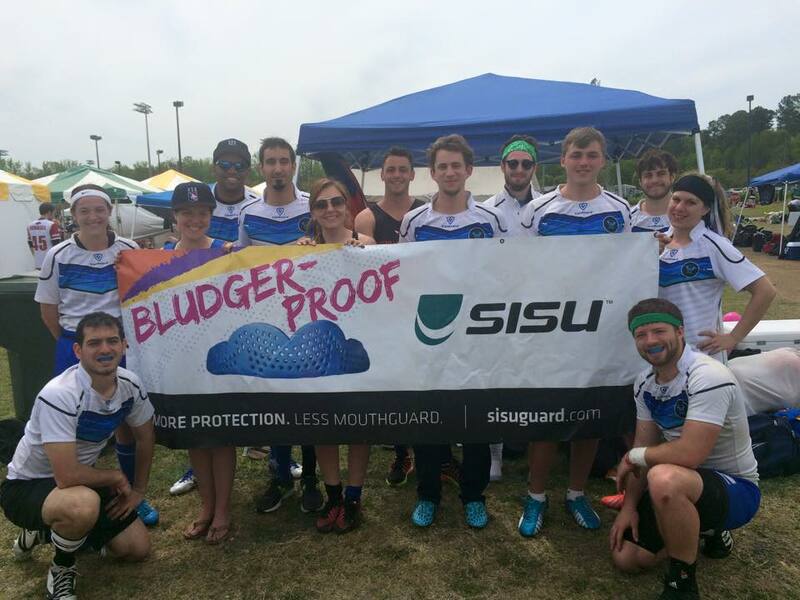 Among those were The Warriors’ partnership with SISU Mouth Guards and Vanguard Rugby. While some may view this as a negative move to commercialize the sport, others saw this as a lesson on negotiation and survival of a team. The Warriors, a team formed in May 2014, began the sponsorship journey the following August. It was, by no means, a simple task obtaining the partnerships the community team managed to snag, but it was certainly worth it in the end. This article will touch upon the team’s secret to success and, ideally, give your team the best shot at securing a sponsorship. Securing a sponsorship is now walk in the park. You’re essentially trying to “sell” your “product” to a business, with that product being your team. Designate someone who is willing to dedicate a few hours a day for about two weeks (though it may require more) to drive the process. Ideally, this individual will be business-savvy and/or have negotiation experience. This can be a team effort. Sit down and brainstorm what your program can offer businesses of varying sizes. Once you have a fairly extensive list (logo placement, banner placement, free tickets, etc. ), break down what each of the items would cost your team. The next step is to break down those items into packages. You will want to have at least three different packages worth varying prices to offer interested parties. 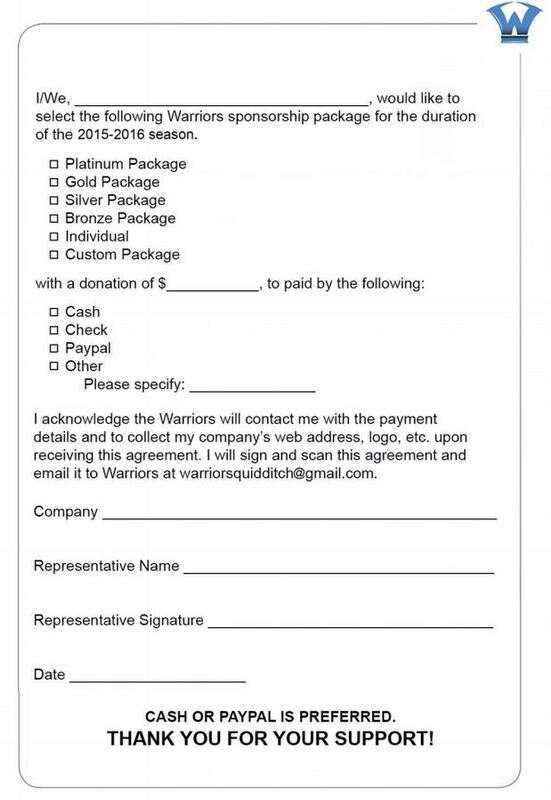 Below is an example of The Warriors’ annual sponsorship packages. Below the name of the package, you will see a quick preview of some items given to the interested party at each level. Reminder: you are selling a product. This means an attractive aesthetic and quality writing is an absolute must. Appoint your most creative team member(s) to this portion of the project. Now, what should go in this packet? Letter to a Potential Sponsor – This should be short, informative and personal. “Dear sponsor,” should kick it off. Then the body of the letter should discuss when your team was founded, the most notable thing about it, a one-paragraph summary of what can be found later in this packet and a thank you for being considered. Benefits – Include a page outlining the benefits of sponsoring your squad. Have you received exposure on major news networks? Do you have any famous players? Is your team in the horserace for a World-Cup title? Past Achievements – Make a list of the major titles your team has obtained: World Cup finishes, conference titles, tournament wins, Team USA members, etc. 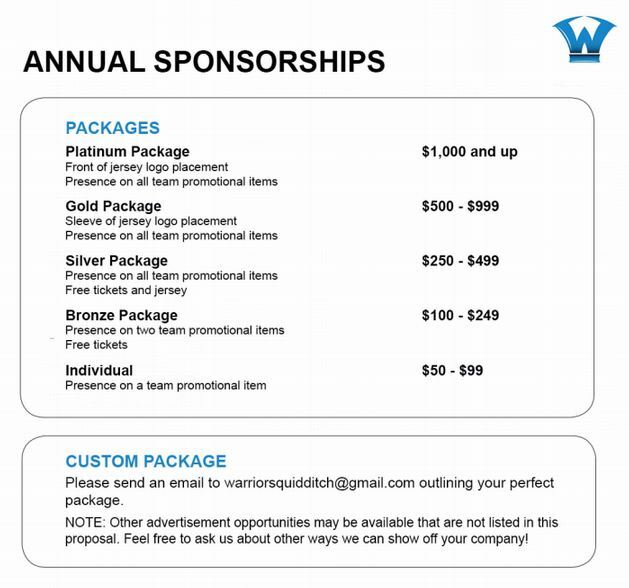 Sponsorship Packages – Your packet should end with the summary of your sponsorship packages/levels followed by the breakdown of each level on the subsequent pages. The final page in your packet should be a form for commitment where the sponsor can note how much they want to give, how the plan to pay and sign off on the deal. Don’t just email every company you can think of. Email companies that would stand to gain something by partnering with a quidditch team. The Warriors sought out mouthguard companies, uniform companies, sports-drink companies and other sports equipment-oriented organizations. The team carefully selected businesses it wouldn’t have to go too far out of the way to promote and that would actually have an opportunity at gaining customers based on the population represented in the quidditch community. For example, The Warriors chose to partner with SISU. Though mouthguards are now required, when The Warriors contacted SISU and a slew of other mouthguard companies, few players donned the protective plastic at will. Enter yet another business opportunity. It was only a matter of time before the full-contact sport required the gear, so The Warriors opted to build a relationship with a mouthguard company sooner rather than later. Roughly 15 of these businesses were contacted and three opened negotiations. SISU was selected not only for the monetary gains it offered the team, but for its overall attitude toward the growth of the sport and its desire to culminate a relationship with The Warriors program (which we’ll touch on more late in this article). A year later, SISU is all over your Facebook newsfeed and hundreds of players have purchased guards from the small, Michigan-based company, and they’ve renewed their standing partnership with The Warriors. I’m the captain of the Fighting Sturms. My team is looking for sponsors for the 2015-16 season. Please see the attached packet for more details. Unless you want to be ignored, that is. Write a two to three paragraph email stating who you are, why you’re reaching out to this company specifically–does your team drink a lot of Gatorade? Do your players love SISU guards–-and two to three things you can offer. Then state more info can be found in the attached PDF version of your sponsorship packet. This may not seem like the most difficult part of the process, but it is. After you have contacted every company your brain and Google have yielded, you need to wait for the response. It could take anywhere from a few hours to a few weeks to hear back from a real person and not an auto-generated email. Once you do receive that coveted, “Yes! We’re interested in working with your team!” do not just jump on the first offer presented to you. Work with the individual that approached you to negotiate what is best for both parties. The typical rule of thumb is to accept a sponsorship that offers you three times what you’re giving the company in exchange. Once you have reached an agreement and signed off with your new sponsor, tell the world! Link to the company on your team’s Facebook, Twitter, Instagram, etc. and have each of your teammates like or follow them on social media. Show them from the very beginning that you will do your absolute best to help them gain attention in the quidditch community. You should also try to conduct monthly check-ins to let them know how their investment–your team–is doing. Send your contact person photos of the team (with credit to the photographer) using their product at tournaments and practices and updates on your current ranking or recent tournament wins. Remember, it is your job to make your sponsor feel like part of your squad. If you have further questions, feel free to contact Editor-in-Chief and Warriors Assistant Captain Amanda Dallas at amanda.dallas@eighthman.com.